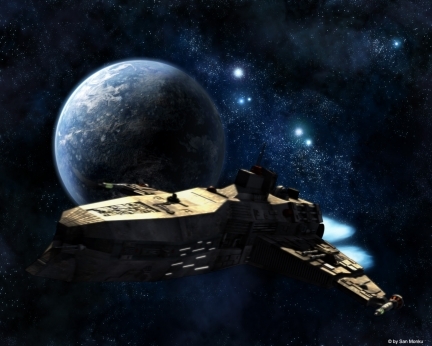 Want to read a space opera? I’m going to do something a little different with my writing. It’s obvious I haven’t written in some time. I promised to work on Guardian of Destiny, but lost interest. The tediousness of watching my grammar and punctuation along with trying to create an engaging setting has made writing a chore. So my new idea is just to write. I have a new tale to tell. This one is science fiction. If you’ve read my fantasy novels, The Dukarian Legacy trilogy, then you may notice that the main character in this sci-fi story is similar in a lot of ways. What can I say? His character inspires me. I haven’t exactly duplicated him. The two characters are distinct enough to be different, but they share many parallels. I won’t tell you what those are. I don’t want to spoil the story. So besides being sci-fi, what am I doing differently (as indicated above)? Many things. For one, I’m going to post most of the story here. I’m going to post it bit by bit. For another, I’m not going to worry about spelling, grammar, punctuation, or anything. I’m just going to write. So if you’re just looking for a fun read, sign up for my blog and come along for a space ride. So much for my promise to finish writing the Guardian of Destiny in 2014. And you may have noticed that I haven’t been posting once a week as promised either. I have to admit that much of the reason is due to procrastination. But I do have a few good excuses too. I’m going to tell you about those, then I’m going to tell you a little about my future plans. Sometime in March, my mom was diagnosed with brain cancer. In light of that diagnosis, my mom decided she wanted to move from Missouri back home to Oregon. During that process, she spent a week at my house in Kansas. And during that time, my husband was offered a new job in Iowa. Things moved really fast from there. After spending time with my mom in Oregon, I began organizing home repairs. We had carpeting replaced, the wooden floors repaired, painting, mud jacking, and more. We also had to look for a new place in Des Moines, pack, and organize the move. After that, we had to move in, unpack, and settle in. Until this month, I’ve barely had time to read a book, let alone write one. My mom is not doing well health-wise. She is getting worse, but she is in amazingly good spirits. And she is in good hands in Oregon with my step-dad, sisters, and a good friend of hers. Anyway, I think things have settled down enough that I can get back into writing and blogging. In fact, I have a great story idea. And the good news here is that I’m going to write it here on this blog. You’ll get to see it in the raw. Look for more details next week! What about the Guardian of Destiny? Sorry, that is on the back burner for now. It’s the way of some of us artists. We get inspired by something and go into it full force. On the flip size, if we lose that inspiration our project gets set aside. I will, by no means, put Guardian of Destiny on a shelf to collect dust. I will work on it from time to time as the inspiration motivates me. But don’t count on it being finished any time soon. You might just like the new project I’m working on much more interesting.